Memory impairment is one of the greatest concerns when it comes to long-term CNS-affecting drug administration. Drugs like gabapentin, pregabalin and baclofen are administered in a long-term period in conditions such as epilepsy, neuropathic pain, spasticity associated with spinal cord injury or multiple sclerosis. Despite their wide spread use, few data are available on the effects of these drugs on cognitive functions, such as learning memory. In the present study, the effects of long-term administration of gabapentin, pregabalin and baclofen on memory were investigated in a comparative manner. Male Wistar rats received intraperitoneal (i.p.) injection of gabapentin (30 mg/kg), pregabalin (30 mg/kg), baclofen (3 mg/kg), combination of gabapentin/baclofen (30/3 mg/kg) and combination of pregabalin/baclofen (30/3 mg/kg) once a day for 3 weeks respective to their groups. After the end of treatments, rat memories were assessed using the object-recognition task. The discrimination and recognition indices (RI and DI) in the T2 trials were used as the memory indicating factors. The results showed that daily i.p. administrations of pregabalin but not gabapentin or baclofen significantly decreased DI and RI compared to saline group. In combination groups, either gabapentin or pregabalin impaired discrimination between new and familiar objects. Our findings suggested that pregabalin alone or in combination with baclofen significantly caused cognitive deficits. Neuropathic pain (NP) is a pain incepted or caused by a primary disease, lesion or dysfunction in the nervous system . It has varied causes such as spinal cord injury, stroke, multiple sclerosis, diabetes mellitus, neoplasia tumors and other diseases affecting the CNS ,. Neuropathic pain thus affects a large number of patients worldwide and often it has a significant impact on the quality of life ,. In patients with upper motor neuron disease, persistent pain can be associated with spasticity . Antiepileptic drugs are used for treating epilepsy, but have also been used for treating neuropathic pain . Baclofen is a muscle relaxant and an antispastic agent. It is used to treat spasms, pain, and stiffness ,. Antiepileptic drugs work in a number of different ways, all of which have relevance to their effect on pain. Gabapentin is an antiepileptic drug that, despite its name, has no interaction with GABA receptors or GABA metabolism . It appears to have an inhibitory action at voltage-gated calcium channels (VGCCs) and also disrupt an entire series of N-methyl-D-aspartate (NMDA)- activated events involved in central sensitization ,. Pregabalin is a more recently developed drug that (like gabapentin) is licensed for the treatment of peripheral neuropathic pain. It acts on the VGCCs too, although its pharmacokinetic properties are not identical to those of gabapentin ,. Baclofen is a GABAB receptor agonist that is mainly used for the treatment of spasticity . Baclofen is postulated to block mono-and- polysynaptic reflexes by acting as an inhibitory neurotransmitter, blocking the release of excitatory transmitters. Baclofen also has been found to block VGCCs ,. Pharmacological interference has the potential to disrupt normal neurotransmission in areas of the brain responsible for cognitive functions. Antiepileptic drugs can adversely affect cognitive function by suppressing neuronal excitability or enhancing inhibitory neurotransmission . On the other hand, there is extensive evidence indicating that the administration of GABAergic drugs can cause cognitive deficits but very few studies have addressed this issue . The object recognition task (ORT) is used to evaluate cognition, particularly recognition memory, in rodent models of CNS disorders. This test is based on the spontaneous tendency of rodents to spend more time exploring a novel object than a familiar one. The choice to explore the novel object reflects the use of learning and recognition memory. Antiepileptic drugs such as gabapentin and pregabalin and other adjuvant drugs like baclofen are increasingly used in treatment of neuropathic pain. Because of the side effects of long-term treatment with these drugs, we decided to evaluate the chronic effect of gabapentin, pregabalin and baclofen alone and in combination on rat memory using ORT. The data of this study was compared with scopolamine that induces memory deficits in ORT model . Adult male Wistar rats (weighing 200 ± 20 g) were obtained from animal house of School of Pharmacy at Isfahan University of Medical Sciences. The animals were maintained on a 12-h light/dark cycle. Animals had free access to food and water before and throughout the experiments. The animals were maintained in Plexiglas home cages (60 × 25 × 25 cm). The study protocol was approved by the Bioethics Committee of Isfahan University of Medical Sciences (Registration No. 3941002), and performed in accordance with National Institute of Health Guide for the Care and Use of Laboratory Animals. Gabapentin, pregabalin, baclofen and scopolamine were purchased from Merck Co. (Germany). These three drugs were freshly dissolved in distilled water and scopolamine solution was prepared freshly in saline and administered by intraperitoneal (i.p) injection. All drug solutions were freshly prepared before each experiment. Drug injection was made between 8-10 A.M every day. The apparatus consisted of a circular arena, 83 cm in diameter and 40 cm high wall, made of white polyvinyl chloride. We used two different sets of objects consisted of (1) a heavy aluminum cube (10.0 × 5.0 × 7.5 cm) and (2) a heavy aluminum cube with a tapering top (13.0 χ 8.0 χ 8.0 cm). The objects could not be displaced by rats. Animals were divided into seven groups of 6 each as follows: control group, receiving normal saline; negative control group, received scopolamine (0.5 mg/kg); gabapentin, (30 mg/kg) ; pregabalin, (30 mg/kg) ; baclofen, (3 mg/kg) ; the combination of gabapentin/baclofen (30/3 mg/kg) and the combination of pregabalin/baclofen (30/3 mg/kg). Drugs were administered by i.p. injections for 21 consecutive days. One week prior to the behavioral test, animals were handled daily and were adapted to the procedure; they were allowed to freely explore the apparatus in the absence of objects twice daily in 5 min period with 1 h intervals (habitation phase). Object recognition consisted of three clearly defined phases: a training session or first trial (T1), a training-test interval, and a test session or second trial (T2). 24 h after the completion of drug administration, the T1 trial was performed. During the first trial (T1), in the ORT, each rat was placed into the arena and exposed to two identical objects (A1 and A2) for a period of 5 min. Two objects were placed in a symmetrical position about 10 cm away from the wall. The rats were then returned to their home cage for a 1 h inter-trial interval. To avoid the presence of olfactory trails, sawdust was stirred and the objects were thoroughly cleaned with 70% ethanol after each rat was brought out from the arena. Then, both objects were removed and one was replaced with an identical familiar copy and one with a novel object. Then, rats were returned to explore the familiar (A) and the novel object (B) in the test session (T2) lasting 5 min. Exploration was defined as follows: directing the nose to the object at a distance of no more than 2 cm and/or touching the object with the nose. Sitting on the object was not considered exploratory behavior. The exploration time (s) for each object in each trial was recorded and the following factors were calculated: e1, is the total exploration time of both objects in the first trial (eA1 + eA2), e2: is the total exploration time of both objects in the second trial (eA + eB), DI: is the discrimination index (eB - eA)/ (eB + eA) which indicates the discrimination between the new and the familiar objects. Its value vary between +1 and -1, where a positive score indicates more time spent with the novel object, a negative score indicates more time spent with the familiar object, and a zero score indicates a null preference. F is the frequency of the object exploration. Another measure of the ORT is the RI which is the time spent to explore the novel object relative to the both object exploration time and calculated as RI = eB/(eB + eA). In every session, animals that explored less than 7 s in the second trial (e2<7) were excluded from analysis ,,,. To avoid the presence of olfactory trails, the objects were always thoroughly cleaned with alcohol (70%). Moreover, each object was available in triplicate so neither of the two objects from the first trial had to be used as the familiar object in the second trial. In addition, all combinations and locations of objects were used in a balanced manner to reduce potential biases due to preferences for particular locations or objects ,. All data were expressed as the mean ± SEM. Statistical analysis used one-way or two-way analysis of variance (ANOVA). Post hoc comparisons were made using Tukey test. One-sample t tests were used to determine whether the DI was different from zero. A probability level of P < 0.05 was accepted as statistical significance. Daily i.p administration of gabapentin and baclofen alone for 21 consecutive days did not significantly affect the DI in comparison to the control group [Figure 1]. Pregabalin alone and in combination with baclofen impaired rats learning memory as confirmed by a significant difference compared to control group (P < 0.05). There was an intra-group difference between gabapentin and pregabalin group (P < 0.05). The combination of gabapentin/baclofen decreased the DI as confirmed by a significant group difference compared to control group (P < 0.05). There was a significant intra-group difference between gabapentin alone and combination of gabapentin/baclofen (P < 0.01). 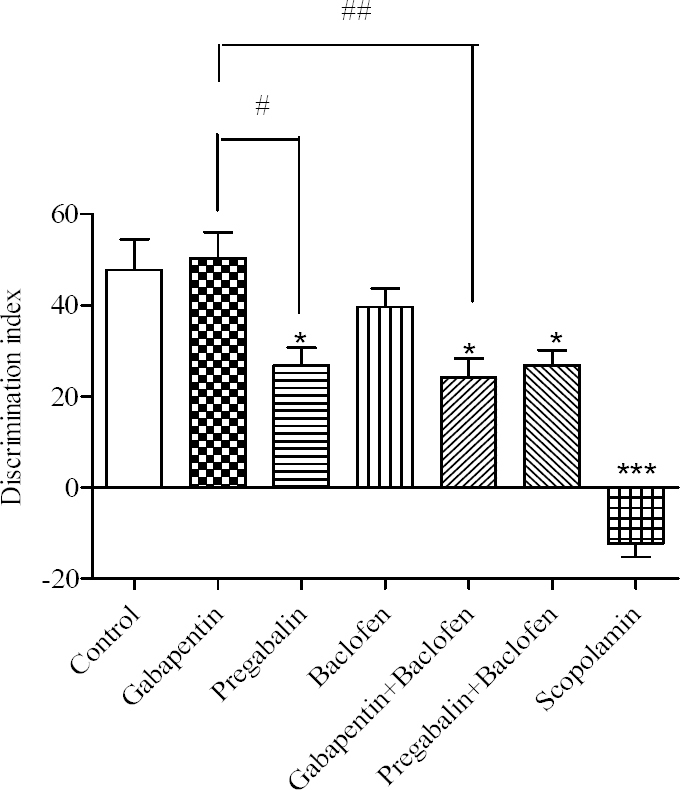 Figure 1: Comparative effects of gabapentin, pregabalin, baclofen and the combinations on the discrimination index. Gabapentin (30 mg/kg), pregabalin (30 mg/kg), baclofen (3 mg/kg), gabapentin/baclofen (30/3 mg/kg) and pregabalin/baclofen (30/3 mg/kg) were administered i.p. for 21 consecutive days, from 8-10 A.M every day. Animal performance was evaluated 24 h after the last injection. Data are expressed as means ± SEM. *P < 0.05 and ***P < 0.001 vs control group, #P < 0.05 gabapentin vs pregabalin group. ##P < 0.01 gabapentin vs gabapentin/baclofen. Daily i.p administration of gabapentin, pregabalin and baclofen alone or in combination, for 21 consecutive days, did not significantly affect the RI in comparison to the control group [Figure 2]. Gabapentin treated rats showed a significant difference with pregabalin group confirmed by an intra-group difference (P < 0.05). There was an intra- group difference between rats treated with gabapentin alone and those received combination of gabapentin/baclofen (P < 0.05). Figure 2: Comparative effects of gabapentin, pregabalin, baclofen and the combinations on the recognition index. Gabapentin (30 mg/kg), pregabalin (30 mg/kg) and baclofen (3 mg/kg), gabapentin/baclofen (30/3 mg/kg) and pregabalin/baclofen (30/3 mg/kg) were administered i.p. for 21 consecutive days, from 8-10 A.M every day. Animal performance was evaluated 24 h after the last injection. Data are expressed as means ± SEM. ***P < 0.001 vs control group, #P < 0.05 pregabalin and the combination of gabapentin/baclofen vs gabapentin group. There are extensive evidences indicating that the administration of GABAergic drugs affects memory retention and learning. It has been shown that GABA receptor agonists impair memory and antagonists facilitate memory . Antiepileptic drugs can adversely affect cognitive function by suppressing neuronal excitability or enhancing inhibitory neurotransmission . Cognitive effects of gabapentin and other antiepileptic drugs have been compared in a number of clinical studies. Leach, et al. studied gabapentin in 27 patients in an add-on polytherapy study after 4 weeks of adjunctive therapy and found no change in psychomotor and memory tests. Drowsiness was more often found in higher dosing (2400 mg) . Mortimore, et a.l did not find a difference between continued polytherapy or an add-on with gabapentin in measures of quality of life . Martin, et al. used an acute dose and rapid titration in 6 volunteers and did not find cognitive effects of gabapentin . In a small randomized double blind placebo controlled crossover study that was done in healthy volunteers that were treated by single low dosages (50-400 mg) of gabapentin showed a subtle positive psychotropic effects (e.g. improved concentration and attention) . Gabapentin acutely harms neuronal pathway via adjustment of the mechanism of neuronal cognitive pathway in different steps of learning tasks . An increase of the incidence of memory disorders was also associated with pregabalin use. This drug is mentioned in particular in a publication reporting cases of treated patients, which manifested partial significant impairments in episodic memory of verbal and visual information . A randomized double-blind three-period crossover study administering 450 mg/day pregabalin to healthy volunteers found no significant effects on the objective measures of reaction time, vigilance, and short-term memory, although it was associated with subjective sedation, critical flicker fusion, and divided attention . In a short-term comparative add-on trial in adult patients with refractory partial epilepsy, add-on pregabalin induced partly significant impairments in the episodic memory of verbal and visual information, whereas add-on levetiracetam improved visual short-term memory performance. In another study, chronic administration of pregabalin caused memory impairment in mice when assessed by step-down passive avoidance task . The negative neuropsychological effects of pregabalin are thought to be temporary under titration . Our results showed that pregabalin alone and in combination with baclofen affected ORT indices (RI and DI) and caused cognitive impairment. There was also an intra-group difference between gabapentin and pregabalin in DI and RI. Pregabalin affected DI and RI more than gabapentin. It may be explained by differences between molecular interactions with their sites of action. Previous studies indicated that pregabalin acts via the same basic mechanisms as gabapentin to inhibit voltage-activated Ca2+ channels and that these inhibitory actions are independent of GABA receptor activation. Some features of the actions of pregabalin on intermediate size and large dorsal root ganglion (DRG) neurons appear not to be seen with gabapentin. The actions of pregabalin may involve both extracellular and intracellular target sites and modulation of a variety of neuronal conductances, by direct interactions, and through intracellular signaling involving protein kinase A. On the other hand, gabapentin appears to be less effective than pregabalin at modulating K+-evoked Ca2+ transients in DRG neurons . Gabapentin and pregabalin are concluded to have a comparabale, if not identical mechanism of action; however they differ in their pharmacokinetic and pharmacodynamic characteristics too . The intra-group difference between gabapentin treated rats with pregabalin group could be also linked to their difference in mentioned characteristics. Baclofen is a selective GABAB receptor agonist that inhibits neurotransmitter release in the dorsal and ventral horns of the spinal cord . The GABAB agonist baclofen had a biphasic effect on working memory function in the radial-arm maze . In the low dose range, baclofen caused a significant memory improvement, while in the high dose range baclofen impaired memory . We find that baclofen (3 mg/kg) alone did not affect ORT indices but in combination with gabapentin or pregabalin caused memory impairment. Moreover, the possibility of involvement of monoamines in pharmacological effects of baclofen is supported by the results of biochemical studies which have shown significant effects of baclofen on the content, release and turnover of these agents in various brain regions . Data obtained by some investigators indicate that retention is enhanced by adrenoceptor agonists . Furthermore baclofen in combination with gabapentin and pregabalin can cause memory impairment because of their additive effects in combination therapy on inhibition of excitatory neurotransmitters and hippocampal-memory network. In the present study we showed that the long-term administrations of gabapentin and baclofen had no effects on memory. Pregabalin alone caused memory impairment and both pregabalin and gabapentin in combination with baclofen affected the ORT indices in comparison with control group. These results suggest that simultaneous administration of baclofen with gabapentin or pregabalin can cause memory deficits due to their additive effects in combination therapy on inhibition of excitatory neurotransmitters. The content of this paper is extracted from the Pharm. D thesis NO. 3941002 submitted by A. Salimzade which was financially supported by the Research Department of Isfahan University of Medical Sciences, Isfahan, Iran. Finnerup NB, Attal N, Haroutounian S, McNicol E, Baron R, Dworkin RH, et al. Pharmacotherapy for neuropathic pain in adults: a systematic review and meta-analysis. The Lancet Neurol. 2015;14(2):162-173. Jensen TS, Baron R, Haanpää M, Kalso E, Loeser JD, Rice AS, et al. A new definition of neuropathic pain. Pain. 2011;152(10):2204-2205. Jensen TS. Anticonvulsants in neuropathic pain: rationale and clinical evidence. Eur J Pain. 2002;6(Suppl A):61-68. Hanna M, O’Brien C, Wilson MC. Prolonged-release oxycodone enhances the effects of existing gabapentin therapy in painful diabetic neuropathy patients. Eur J Pain. 2008;12(6):804-813. Ivanhoe CB, Reistetter TA. Spasticity: the misunderstood part of the upper motor neuron syndrome. Am J Phys Med Rehabil. 2004;83(10):S3-S9. Vinik A. Use of antiepileptic drugs in the treatment of chronic painful diabetic neuropathy. J Clin Endocrin Metab. 2005;90(8):4936-4945. Lind G, Meyerson BA, Winter J, Linderoth B. Intrathecal baclofen as adjuvant therapy to enhance the effect of spinal cord stimulation in neuropathic pain: a pilot study. Eur J Pain. 2004;8(4):377-383. Lind G, Schechtmann G, Winter J, Meyerson BA, Linderoth B. Baclofen-enhanced spinal cord stimulation and intrathecal baclofen alone for neuropathic pain: Long-term outcome of a pilot study. Eur J Pain. 2008;12(1):132136. Rabchevsky AG, Patel SP, Lyttle TS, Eldahan KC, O’Dell CR, Zhang Y, et al. Effects of gabapentin on muscle spasticity and both induced as well as spontaneous autonomic dysreflexia after complete spinal cord injury. Front_Physiol. 2012; 3:329. Taylor CP. Mechanisms of analgesia by gabapentin and pregabalin-calcium channel α2-δ [Cav α2-δ] ligands. Pain. 2009;142(1-2):13-16. Cheng JK, Chen CC, Yang JR, Chiou LC. The antiallodynic action target of intrathecal gabapentin: Ca2+ channels, KATP channels or N-methyl-d- aspartic acid receptors? Anesthesia and analgesia. 2006;102(1):182-187. Micheva KD, Taylor CP, Smith S J. Pregabalin reduces the release of synaptic vesicles from cultured hippocampal neurons. Mol Pharmacol. 2006;70(2):467-476. Tassone DM, Boy ce E, Guy er J, Nuzum D. Pregabalin: a novel γ-aminobutyric acid analogue in the treatment of neuropathic pain, partial-onset seizures, and anxiety disorders. Clin Ther. 2007;29(1):26-48. Meyerson BA, Linderoth B. Mode of action of spinal cord stimulation in neuropathic pain. J Pain Symptom Manage. 2006;31(4):S6-S12. Saulino M, Burton A, Danyo D, Frost S, Glanzer J, Solanki D. Intrathecal ziconotide and baclofen provide pain relief in seven patients with neuropathic pain and spasticity: case reports. Eur J Phys Rehabil Med. 2009;45(1):61-67. Meador KJ. Cognitive and memory effects of the new antiepileptic drugs. Epilepsy Res. 2006;68(1):63-67. Mula M, Trimble MR. Antiepileptic drug-induced cognitive adverse effects. CNS drugs. 2009;23(2):121-137. Kim D-H, Ryu J-H. Differential effects of scopolamine on memory processes in the object recognition test and the Morris water maze test in mice. Biomol Ther. 2008;16(3):173-178. Gregoire S, Michaud V, Chapuy E, Eschalier A, Ardid D. Study of emotional and cognitive impairments in mononeuropathic rats: effect of duloxetine and gabapentin. Pain. 2012;153(8): 16571663. Baastrup C, Jensen TS, Finnerup NB. Pregabalin attenuates place escape/avoidance behavior in a rat model of spinal cord injury. Brain Res. 2011;1370:129-135. McNamara RK, Skelton RW. Baclofen, a selective GABAB receptor agonist, dose-dependently impairs spatial learning in rats. Pharmacol Biochem Behav. 1996;53(2):303-308. Ennaceur A, Neave N, Aggleton JP. Spontaneous object recognition and object location memory in rats: the effects of lesions in the cingulate cortices, the medial prefrontal cortex, the cingulum bundle and the fornix. Exp Brain Res. 1997;113(3):509-519. Antunes M, Biala G. The novel object recognition memory: neurobiology, test procedure, and its modifications. Cogn Process. 2012;13(2):93-110. Zarrindast MR, Bakhsha A, Rostami P, Shafaghi B. Effects of intrahippocampal injection of GABAergic drugs on memory retention of passive avoidance learning in rats. J Psychopharmacol. 2002;16(4):313- 3139. Motamedi GK, Meador KJ. Antiepileptic drugs and memory. Epilepsy Behav. 2004;5(4):435-439. Leach JP, Girvan J, Paul A, Brodie MJ. Gabapentin and cognition: a double blind, dose ranging, placebo controlled study in refractory epilepsy. J Neurol Neurosurg Psychiatry . 1997;62(4):372-376. Mortimore C, Trimble M, Emmers E. Effects of gabapentin on cognition and quality of life in patients with epilepsy. Seizure. 1998;7(5):359-364. Martin R, Kuzniecky R, Ho S, Hetherington H, Pan J, Sinclair K, et al. Cognitive effects of topiramate, gabapentin, and lamotrigine in healthy young adults. Neurology. 1999;52(2):321-327. Ortinski P, Meador KJ. Cognitive side effects of antiepileptic drugs. Epilepsy Behav. 2004;5:60-65. Salinsky M, Storzbach D, Spencer D, Oken B, Landry T, Dodrill C. Effects of topiramate and gabapentin on cognitive abilities in healthy volunteers. Neurology. 2005;64(5):792-798. Chavant F, Favrelière S, Lafay-Chebassier C, Plazanet C, Pérault-Pochat MC. Memory disorders associated with consumption of drugs: updating through a case/noncase study in the French PharmacoVigilance Database. Br J Clin Pharmacol. 2011;72(6):898-904. Salinsky M, Storzbach D, Munoz S. Cognitive effects of pregabalin in healthy volunteers A doubleblind, placebo-controlled trial. Neurology. 2010;74(9):755-761. Mohan AJ, Krishna K, Jisham K, Mehdi S, Nidavani RB. Protective effect of tulsi and levetiracetam on memory impairment induced by pregabalin on mice. IOSR J Pharm Biol Sci. 2014;9:46-52. Ciesielski A-S, Samson S, Steinhoff BJ. Neuropsychological and psychiatric impact of add-on titration of pregabalin versus levetiracetam: a comparative short-term study. Epilepsy Behav. 2006;9(3):424-431. McClelland D, Evans RM, Barkworth L, Martin DJ, Scott RH. A study comparing the actions of gabapentin and pregabalin on the electrophysiological properties of cultured DRG neurones from neonatal rats. BMC Pharmacol. 2004;4:14. 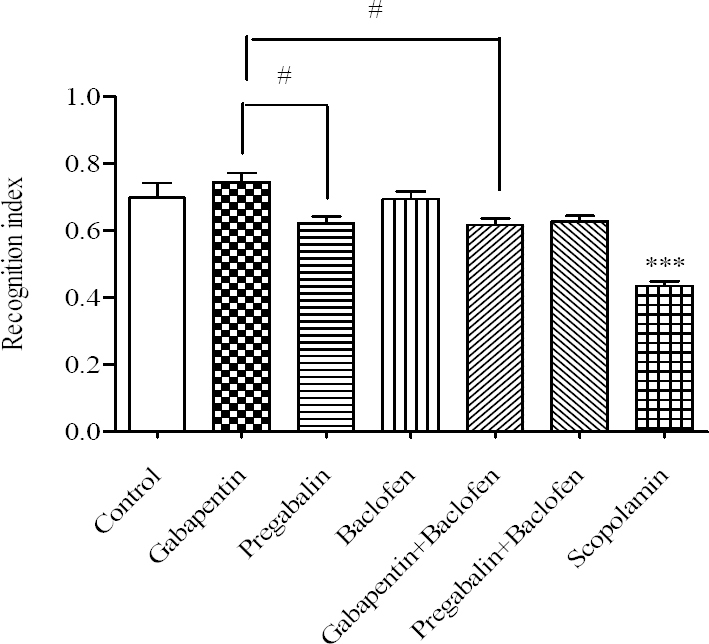 Bockbrader HN, Wesche D, Miller R, Chapel S, Janiczek N, Burger P. A comparison of the pharmacokinetics and pharmacodynamics of pregabalin and gabapentin. Clin Pharmacokinet. 2010;49(10):661-669. Browning KN, Travagli RA. Mechanism of action of baclofen in rat dorsal motor nucleus of the vagus. Am J Physiol Gastrointest Liver Physiol. 2001;280(6):G1106-G1113. Levin ED, Weber E, Icenogle L. Baclofen interactions with nicotine in rats: effects on memory. Pharmacol.Biochem Behav. 2004;79(2):343-348. Zarrindast MR, Khodjastehfar E, Oryan S, Torkaman-Boutorabi A. Baclofen-impairment of memory retention in rats: possible interaction with adrenoceptor mechanism(s). Eur J Pharmacol. 2001;411(3):283-288. Thomas CK, Hager-Ross CK, Klein CS. Effects of baclofen on motor units paralysed by chronic cervical spinal cord injury. Brain. 2010;133 (Pt 1):117-125.